Family agreements, including the settlement of disputes by agreement between husbands and wives, are favored in Pennsylvania and are generally presumed to be valid, binding, and non-modifiable by the courts. Accordingly, if you are contemplating marriage, or divorce, you should be aware that even agreements that foreclose certain rights under the law will be upheld as long as such agreements are not obtained through fraud, misrepresentation, coercion or duress, and as long as there was full disclosure by both parties. In Pennsylvania, agreements regarding marriage and divorce will not be set aside simply because they are one-sided or represent a bad bargain, or if one party later comes to regret having entered the agreement as circumstances change. General contract law will apply, thus you need the guidance of professionals who understand and can interpret such law. Drafting a marital agreement is not a routine exercise. Before you consider, or enter into a marital agreement, you should seek our guidance as an experienced family law firm to ensure that it is both fair and enforceable. It is ill-advised to enter an agreement on the very eve of marriage, or without thoughtful consideration upon divorce. If your circumstances involve children, you will need to understand further complexities that arise because agreements regarding custody and child supportcan be modified by the court. Just some of the issues that our firm will consider when drafting an agreement for you are: disclosure, waiver of estate rights, waiver of rights under the Divorce Code, distribution of property, exclusive occupancy of your home, mortgages, legal fees and expenses, debts, insurance, retirement benefits, alimony and spousal support, remarriage, child support, education, custody, religion and tax issues. 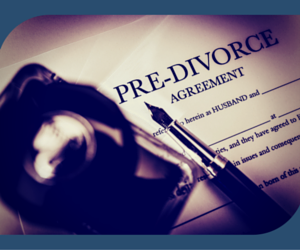 Wilder Mahood McKinley & Oglesby can help you to draft, implement and defend a prenuptial or postnuptial agreement. For more information, contact us online or call our office in Pittsburgh, Pennsylvania, at 412-261-4040.